Abstract: General anesthetics could have deleterious effects on undeveloped brains. Animal studies have shown that antagonism of NMDA and/or GABA receptors can interfere with developing brain cell communication, causing neuronal apoptosis, which can lead to physical cerebral abnormalities, or cognitive and developmental impairment later in life. The human brain develops and grows in weight and size from birth until about the age of 2, making trillions of neuronal connections. Although the brain is born with all the neurons it will ever have, and neuronal death is a natural process of aging, it has been shown that anesthesia can attenuate the rate of cell death. A promising alternative is the drug dexmedetomidine, which agonizes alpha-2 adrenergic receptors and produces hypnosis and sedation. 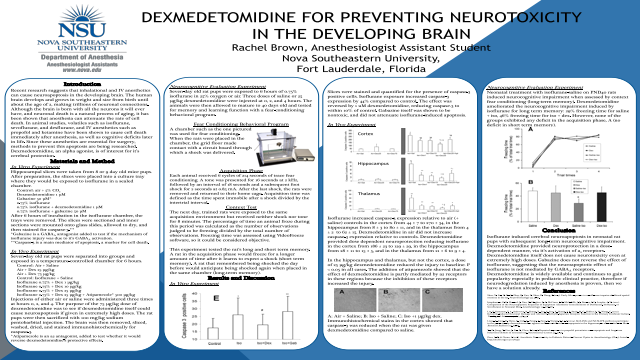 Dexmedetomidine has been shown in rats to inhibit the effects of general anesthetics on neuroapoptosis. Summary: This literature review looks at dexmedetomidine as a neuroprotective agent to be used in the pediatric population to prevent neurotoxicity from IV and inhalational anesthetics.References: Shen, X., Liu, Y., Xu, S., Zhao, Q., Guo, X., Shen, R., Wang, F. (2013). Early life exposure to sevoflurane impairs adulthood spatial memory in the rat. NeuroToxicology 39, 45-56. Istaphanous, G. K., Howard, J., Nan, X., Hughes, E. A., McCann, J. C., McAuliffe, J. J., Danzer, S. C., Loepke, A. W. (2011). Comparison of the Neuroapoptotic Properties of Equipotent Anesthetic Concentrations of Desflurane, Isoflurane, or Sevoflurane in Neonatal Mice. Anesthesiology 114, 578-587. Liu, F., Patterson, T. A., Sadovova, N., Zhang, X., Liu, S., Zou, X., Hanig, J. P., Paule, M. G., Slikker Jr, W., Wang, C. (2012). Ketamine-Induced Neuronal Damage and Altered N-MethylD-Aspartate Receptor Function in Rat Primary Forebrain Culture. Toxological Sciences, 131(2), 548-557.